Abilene Fine Arts Museum. Image available on the Internet and included in accordance with Title 17 U.S.C. Section 107. MUSEUMS OF ABILENE. The Museums of Abilene (renamed The Grace Museum), an omnibus organization offering exhibitions on art, history, and children's education, is located at the Grace Cultural Center at North First and Cypress in Abilene. One of many museums established around the time of the Texas Centennial celebration in 1936, the museum developed from a fall 1937 meeting sponsored by the Art Unit of the Woman's Forum (later the Art Forum). The group determined that the new museum should bring work by national and international artists to Abilene, sponsor lectures and art projects, and build a permanent collection of art. D. A. Bandeen offered the museum space on the second floor of the West Texas Chamber of Commerce building, and the Abilene Museum of Fine Arts opened to the public on November 15, 1939. From a modest opening exhibition consisting of thirty reproductions illustrating the development of portraiture, the Abilene Fine Arts Museum developed a strong exhibition program. Working with organizations such as the Museum of Modern Art in New York City and the American Federation of the Arts in Washington, the museum presented traveling exhibitions featuring art objects from Central and South America, Africa, Australia, China, and Europe. It also exhibited the work of such distinguished national artists as Frank Lloyd Wright, Thomas Hart Benton, Grandma Moses, Peter Hurd, and Jerry Bywaters. The museum provided support for local artists by mounting solo exhibitions and sponsoring annual group shows of regional artists and art students. It supplemented exhibitions with lectures and gallery talks, and after World War II it began offering children's art classes. By 1947 the Abilene Museum of Fine Arts had assembled a permanent collection of sixty-one paintings and sculptures that included works by such Texas artists as Charles T. Bowling, Edward G. Eisenlohr, Mary Motz Wills, and Bill Bomar. Interior of the Abilene Fine Arts Museum (circa 1947). Image available on the Internet and included in accordance with Title 17 U.S.C. Section 107. Between 1947 and 1957 the museum changed its name to the Abilene Fine Arts Museum and widened its scope to include historical exhibitions, although art remained its primary focus. It operated in several temporary locations before constructing a facility in Oscar Rose Park. The 4,500-square-foot building, which opened in 1964, had a large gallery, two smaller exhibition spaces, and storage, maintenance, and classroom areas. Until 1971 the museum was operated by officers elected from the board of trustees; Jessie Kenan Wilder Morgan, president from 1940 to 1965, was particularly influential in shaping the institution's early development. The first professional director, James Bell, was hired in 1971. Grace Hotel in downtown Abilene (circa 1909). Image available on the Internet and included in accordance with Title 17 U.S.C. Section 107. The 1980s were a decade of expansion. In 1980 the museum was entrusted with the care of a collection of historical artifacts acquired over a three-year period by the Junior League of Abilene. 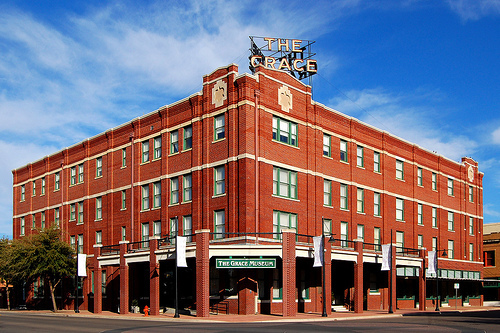 Six years later, plans to establish a history museum became feasible when the museum united with the Abilene Preservation League to restore and remodel the Grace Hotel for use as a cultural center. The Grace, a former luxury hotel built in 1909 to accommodate travelers on the Texas and Pacific Railway line, offered 55,000 square feet of space in a historically rich atmosphere. The museum board appointed a committee of trustees, staff, local historians, and university professors charged with the task of establishing a history museum. Around the same time the Junior League began to develop a children's museum that would also be located in the Grace Cultural Center, which was slated for completion in late 1991. In July 1989 the board voted to change the museum's name to Museums of Abilene, a single organization that would oversee the activities of the art, history, and children's museums. Grace Hotel and Museum. Image available on the Internet and included in accordance with Title 17 U.S.C. Section 107. Renovated ballroom at Grace Hotel. Image available on the Internet and included in accordance with Title 17 U.S.C. Section 107. A group of ambitious and creative civic leaders envisioned the building as a downtown museum, raised the funds, gathered community support, and renovated the 55,000 square foot building. The Dodge Jones Foundation was the major financial backer of the renovation of the building and the revitalization of downtown Abilene. Other foundations contributed to the success of the creation of the new Grace Cultural Center, including the Abell-Hanger, Meadows, Moody and Mabee. Historic restoration architect Rick Weatherl researched and brought back the look of the building in 1935 and planned a state-of-the- art museum facility out of the ruins of the old hotel. The new museum called the Grace Cultural Center opened to the public on February 15, 1992. In 1998 the official name of the downtown museum became The Grace Museum. Grace Hotel and Museum sign. Courtesy of Kevin Halliburton Photography. Image available on the Internet and included in accordance with Title 17 U.S.C. Section 107. A board of no more than thirty-five trustees guides the long-term development of the Museums of Abilene. Board members are elected to three-year terms on a rotating basis. The director implements policies and oversees daily activities. Los Aficionados, a volunteer auxiliary group, assists the staff in raising funds and organizing social events. The Museums of Abilene relies on membership fees and two annual fund-raising events to meet its annual budget, which was $270,000 in 1991. The museum has also won grants from the Texas Commission on the Arts, the National Endowment for the Arts, the National Endowment for the Humanities, and other public organizations in support of special programs. In 1991 the museum's permanent collection had grown to over 2,000 items. The 1989 acquisition of the Texas and Pacific Railway Collection, composed of artifacts and company archives, expanded the historical holdings in an area that was vital to Abilene's development. The art collection includes works on paper by such noted regionalist artists as Grant Wood, Thomas Hart Benton, and Peter Hurd, as well as paintings and prints by Texas artists active between 1920 and 1940. The emphasis on regionalist art is also manifested in an annual competitive exhibition for regional artists and other exhibitions, such as the popular 1989 show Painters of Texas: 1900–1950, which featured the work of E. G. Eisenlohr, Charles T. Bowling, and Jerry Bywaters. Exhibitions are supplemented by gallery tours, classes, workshops, and programs by artists and educators. The museum publishes a quarterly newsletter. The Museums of Abilene is a member of the American Association of Museums, the Texas Association of Museums, and the Permian Basin Museum Institute. In the 21st century, downtown Abilene is vital and bustling with twenty-two historic buildings restored and listed on the National Register of Historic Places. In 2010, the Texas Commission for the Arts recognized Abilene as one of five most important cities in Texas with historic downtown arts districts. Archives, Museums of Abilene, Abilene, Texas. American Art Directory, 1989–90. Handbook of Texas Online, Kendall Curlee, "MUSEUMS OF ABILENE," accessed April 21, 2019, http://www.tshaonline.org/handbook/online/articles/klmpl. Uploaded on June 15, 2010. Modified on April 14, 2016. Published by the Texas State Historical Association.